GOYANG, SOUTH KOREA--(Korea Newswire) September 30, 2016 -- The closing ceremony of the 8th DMZ International Documentary Film Festival (Chairman of Organizing Committee: Nam Kyung-pil; Executive director of the festival: Cho Jae-hyun) was held on September 29th, 2016 at M Hall in Megabox Baekseok and celebrated successful completion of the 8-day documentary film festival. The ceremony was attended by more than 300 persons, including Mayor Choi Sung of Goyang City, Director General Lee Hi-jun of Culture, Sports and Tourism Bureau at Gyeonggi-do provincial government, foreign guests and film directors, members of jury, Korean film directors, and audience. At the closing ceremony, a total of 10 award-winners in different sections were announced, and they were awarded with prize money of 57.5 million won in total and trophies. ‘Those Who Jump’, a documentary film from Denmark (directed by Abou Bakar Sidibe, Moritz Siebert, and Estephan Wagner), was honored with the White Goose Award, the grand prize of the 8th DMZ International Documentary Film Festival. Having recorded processes of passing borders of Morocco and Spain by African refugees avoiding surveillance networks of border guards, this film was evaluated as an outstanding work that shows astonishing vitality that surpasses crisis situation and hardships. 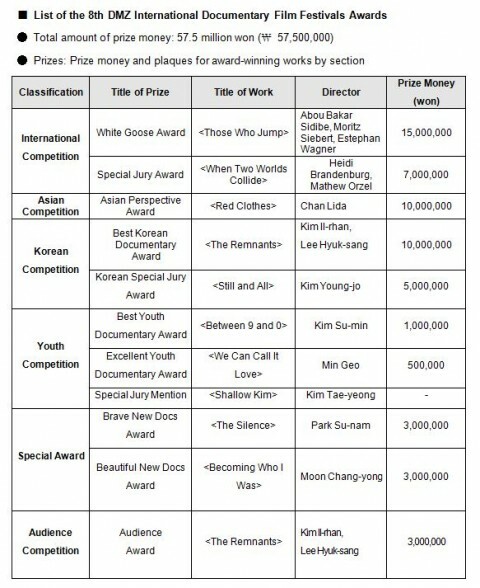 ‘When Two Worlds Collide’ won the Special Jury Award, the second place prize. ‘The Remnants’ that featured stories happened after the disastrous accident in Yongsan directed by Kim Il-rhan and Lee Hyuk-sang won the Korean Documentary Award. This film was honored with double prizes by also receiving the Audience Award. 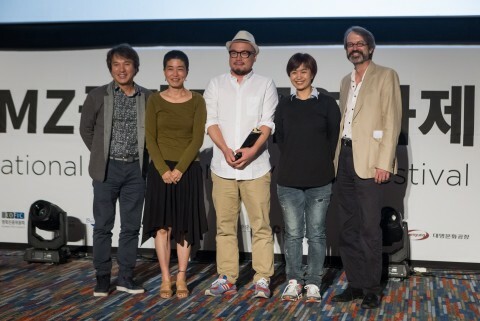 ‘Still and All’ that depicted lives of 5 characters against the backdrop of the Yeongdo Bridge in Busan directed by Kim Young-jo received the Korean Special Jury Award. 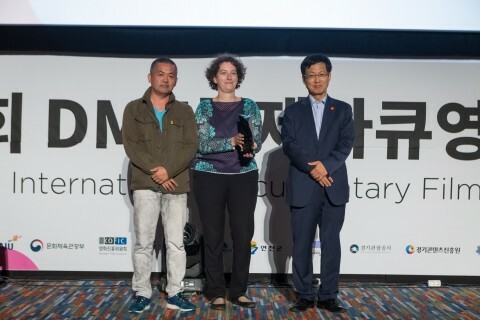 During the period of the 8th DMZ International Documentary Film Festival opened on September 22nd, 2016 at the Camp Greaves in Paju, the audience and film producers enjoyed the festival all together through screening of 116 documentary films from 36 countries, 79 question and answer sessions, and 12 other accompanying events such as talks, lectures and forums. Started with the ‘Docu & Music’ concert held on September 18th, a week ahead of the festival, at the Music Hall in the Goyang Oulim Nuri Arts Center as a prelude to it, the opening ceremony of the 8th DMZ International Documentary Film Festival was held at the Camp Greaves located in the southern civilian access control zone, for the third time since its launch. Moderated by Daniel Lindermann, former German representative to a popular TV program, ‘Abnormal Summit’, and Lee Seol-mi, a young defector from North Korea, the Festival opened its magnificent curtain with attendance by over 700 Korean and foreign guests, including Deputy Governor Lee Jae-yul of Gyeonggi-do, Mayor Lee Jae-hong of Paju, and the chairman of executive committee of the Bucheon International Fantastic Film Festival. In addition to screening of documentary films during the period of the Festival, it presented a variety of programs, including the announcement of supports for producing DMZ documentary films, and ‘contest of documentary films for youths’. And other off-the theater programs included the ‘DMZ familiarization tour’ memorable to both domestic audience and foreign guests, a special outdoor showing of films held at the Yeongang Gallery located in the southern civilian access control zone in Yeoncheon County, and the ‘Youth Live Talk’ given by Chairman Cho Jae-hyeon of Executive Committee and Prof. Seo Gyeong-deok at Sungshin Women’s University. In particular, new attempts introduced by the international documentary film festival this year achieved significant outcomes. This year, the film festival successfully positioned as a representative festival that comprises northern region of Gyeonggi-do Province by including theaters in Gimpo City and Yeoncheon County, in addition to previously participated theaters in Goyang and Paju cities. And, the newly designed DMZ vision section gained favorable response from the audience as it introduced films depicting the reality of a divided nation and prospect of unification. The festival also first introduced the barrier-free service that provided audio description to allow visually impaired audience to enjoy it. Prior to closing, an event was held in the evening of September 27th to announce the list of 20 films selected for providing support for production and distribution of films. And over 600 students took part in the ‘contest of documentary film review’ to write reviews after viewing documentary films. Among participants in the contest, 7 winners in English film review category were awarded with prizes. To view the full release, please refer to the attached file below.